A band spokeswoman told news outlets the band was notified at the last minute that Beyonce would perform to the pre-recorded music. The band played their instruments live. All inaugural music is pre-recorded in case weather conditions or other circumstances could interrupt the programme. 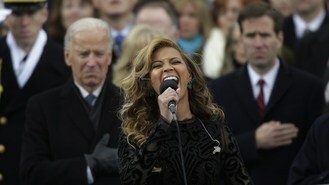 A representative for Beyonce did not immediately respond to requests for comment. Kelly Clarkson's representative said she sang live to perform My Country, 'Tis of Thee. The use of a recording is typical in big events. In 2009, cellist Yo-Yo Ma was questioned about "hand-synching" for Obama's first inauguration. Ma said instruments were not functioning properly in 19-degree weather.